Unleash your engines hidden potential with the Plug n Play BMS Stage 1 tuner. Are you ready to let out the full potential of your BMW F22 220i/228i, F30 320i/328i, F10 520i/528i, F32 420i/428i? We are proud to introduce the first tuner for the N20 and N26 engines! This BMS Burger Tuning Stage 1 Tuner is exactly what you need to make your 328i/528i as fast or faster than a 335i/535i. Installation is very discrete and it quickly removes without a trace when needed. It is fully plug and play and attaches to four easy located sensors under the engine bay. Power gains on a stock N20 Engine are up to 30hp and 40tq to the wheels. 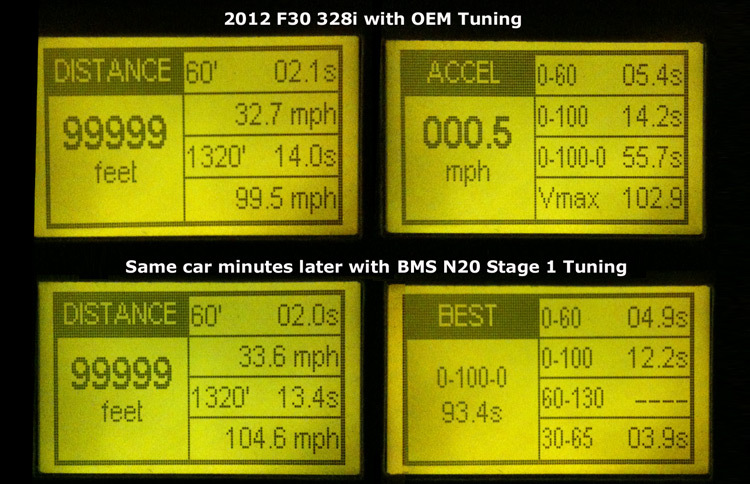 During closed course testing the 2012 F30 328i 0-60 times improved from 5.4 seconds to an incredible 4.9 seconds! This tune is awesome, you can definitely feel the difference in power. The installation guide is perfect, first install may take a bit because of the sensors being tight, but after that it's a five minute thing.